Warm weather and sales of World Cup related goods have helped Sainsbury's to report strong growth in sales. Excluding petrol, like-for-like sales - which exclude new stores - rose 5.7% in the 12 weeks to 17 June. It said the past fortnight, driven by sunny days and football fever, had followed a slower post-Easter period. The performance means it is narrowing the gap on Asda to be the UK's number two supermarket by market share, though has a long way to go to catch Tesco. It is the firm's sixth successive quarter of sales growth, as its recovery plan remains on track. In May, Sainsbury's reported a 12% rise in annual profits to £267m for the year to 25 March. Earlier this month Tesco said like-for-like sales excluding petrol rose 4.5% in the 13 weeks to 27 May. Last week saw a branch of the supermarket in Southampton became the 100th to accommodate online ordering, giving its internet shopping division coverage in 80% of the UK. It also opened four more of its Sainsbury's Local convenience stores as it increased its High Street presence. 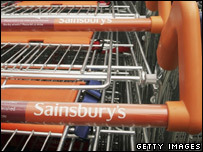 Chief executive Justin King is overseeing a recovery plan of the firm, called Making Sainsbury's Great Again. Initiatives include its Wheel of Health labelling, where products are colour coded according to nutritional content. He has also recruited more staff and involved celebrity chef Jamie Oliver in the Try Something New Today campaign. Meanwhile, in the period to 17 June like-for-like sales, including petrol, have climbed by 7.1%.